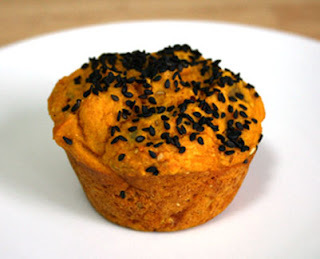 Happy Halloween + Winner of Quick-Fix Vegan! Today is a big day. It's the last day of Vegan MoFo. 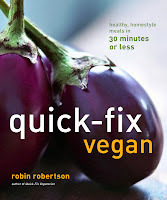 It's time to announce the winner of Quick-Fix Vegan in my latest giveaway. 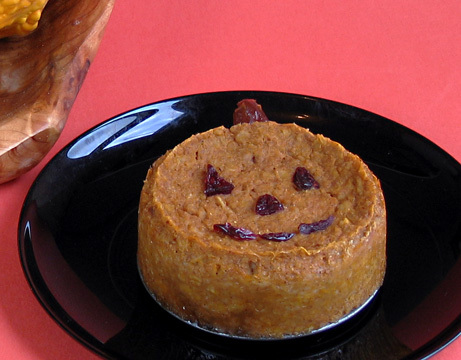 And it's Halloween~and you know what that means: another edible Jack O'Lantern! 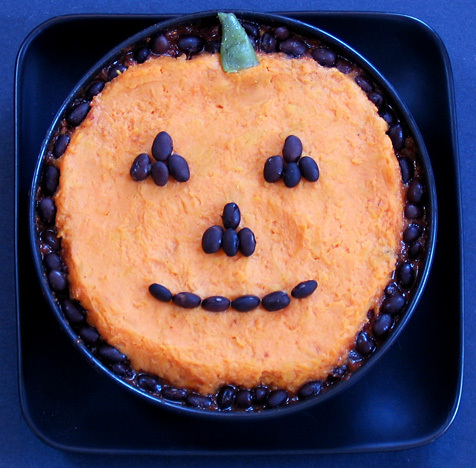 This time, the Jack O' Lantern was made by topping a bowl of black bean chili with some mashed sweet potatoes. Easy to do and so much fun to eat. If you've never had sweet potatoes with a spicy-hot chili, you won't believe how good it is. 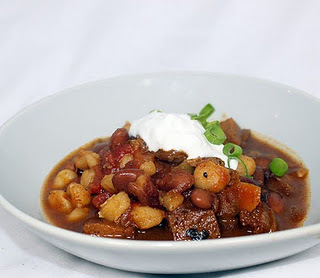 I put extra chipotles in this chili so it is super-spicy. And the creamy sweet potatoes are the perfect way to tame that heat. When I was making the chili, I reserved about a half cup of the cooked black beans so I'd have them to make Jack's face. After placing the beans for the facial features, I had some beans left, so I arranged them on top of the chili, around the edge of the sweet potatoes to help the Jack O'Lantern pop a bit. Jack's little green stem is a piece of Italian pole bean. Almost too cute to eat, huh? Okay, so here's the announcement you've all been waiting for. The winner of a copy of my new cookbook Quick-Fix Vegan -- chosen at random via Random.org -- is comment # 41 by Panda With Cookie!! Congrats, Panda with Cookie! Please e-mail me with your mailing address and I'll get Quick-Fix Vegan in the mail to you. As another Vegan MoFo comes to a close, I'm happy to know that some new subscribers found their way to my blog. From what I hear, some people read the MoFo posts in alphabetical order, so maybe next year I'll change my blog name from "Vegan Planet" to "AA Aardvark." What do you think? Have a safe Halloween everyone, and please, if you have any outdoor kitties, please bring them inside. I'm taking a break from my frenzy of Jack O'Lantern food today. 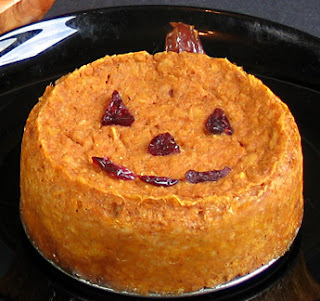 Well, not really, because I'm actually making another Jack O'Lantern-ized dish for tonight's dinner, but it won't be ready to show you until tomorrow. And finally, a loaf of Pumpkin Chocolate Chip Bread -- perfect for this time of year! Is it slow cooker Sunday at your house? 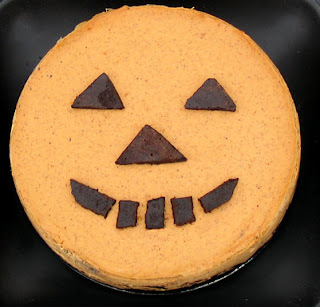 It's Sweet Tooth Saturday and just two days 'til Halloween, so how could I not make a Jack-o-Lantern pumpkin cheesecake?? This is my basic pumpkin cheesecake recipe, with the addition of the happy Jack face that I made by combining melted chocolate with some chocolate cookie crumbs that I spread out and chilled before cutting into shapes. 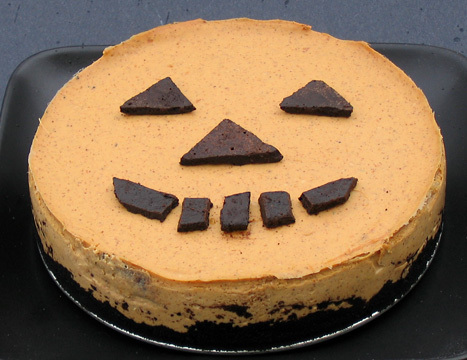 Here's another pic of Jack from another angle -- I used a chocolate cookie crumb crust to give more of an "orange and black" appearance to the cheesecake. I'll keep this post short today because it's snowing (in October!!) and the power keeps flickering on and off. It's a heavy wet snow and the leaves are still on the trees, so limbs are snapping everywhere. I don't know how long we'll have power today, but I couldn't let Sweet Tooth Saturday go by without sharing Mr. Jack o'Cheesecake! 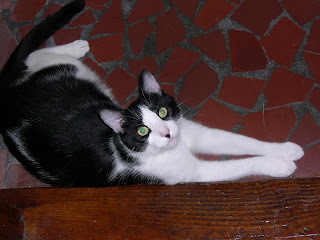 And I couldn't let Caturday slip by without a photo of Gary "Long-legs"! Gary is a very tall boy, and this photo gives you an idea of just how long his legs are. Since today is “Flashback Friday” and my theme this week is Halloween, it seems fitting that today’s post is favorites from Halloweens past, specifically the Halloween menu from my book, Party Vegan: Fabulous, Fun Food for Every Occasion. … to these adorable pumpkin muffins (photo of muffins and chili by Tamasin Noyes). 1. Cut the squash into 1/4-inch dice and set aside. In a large saucepan, heat the oil over medium heat. Add the onion, squash, carrot, and bell pepper, if using. Cover and cook, until softened, about 10 minutes. 2. Add the tomatoes, tomato paste, black beans, and chipotle. Stir in the apple juice, chili powder, allspice, sugar, and salt and black pepper to taste. Bring to a boil, then reduce the heat to low. Simmer, covered, until the vegetables are tender, about 30 minutes, stirring occasionally. 3. Uncover and simmer about 10 minutes longer. Serve hot. 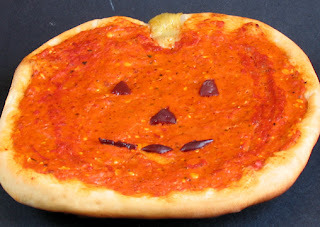 In my continuing obsession with Halloween themed food, today's post features pizza! The top photo shows a Jack o' Lantern pizza. It may not be the prettiest Jack o' Lantern, but he sure was tasty. I blended the pizza sauce and spices with some vegan cream cheese to lighten the color from red to orange. I then "brushed" some red pizza sauce on each side of the face (hard to see in the photo) to add some depth. 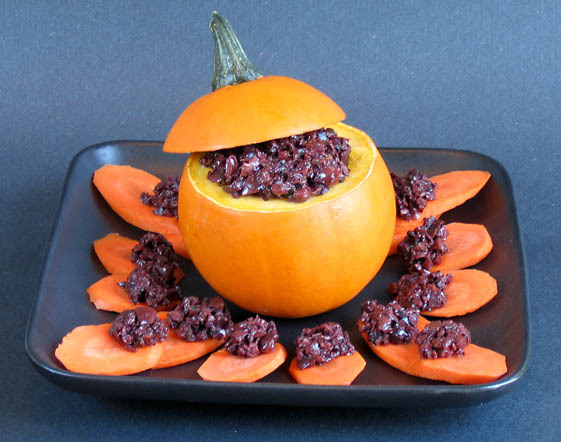 The facial features are made out of kalamata olives and the pumpkin stem is a piece of artichoke heart. I put this together quickly with on-hand ingredients, but if I were to to it for guests, I might use slices of eggplant (peel side up) for some or all of the features to be larger and more dramatic. 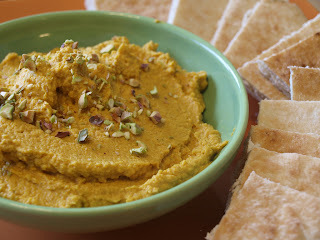 And if yesterday's baked pumpkin oatmeal wasn't enough pumpkin for you, try this Moroccan-Spiced Pumpkin Hummus from Quick-Fix Vegan -- the recipe is posted on GoDairyFree.org. Stay tuned for more Halloween treats -- no tricks -- during the rest of this week. 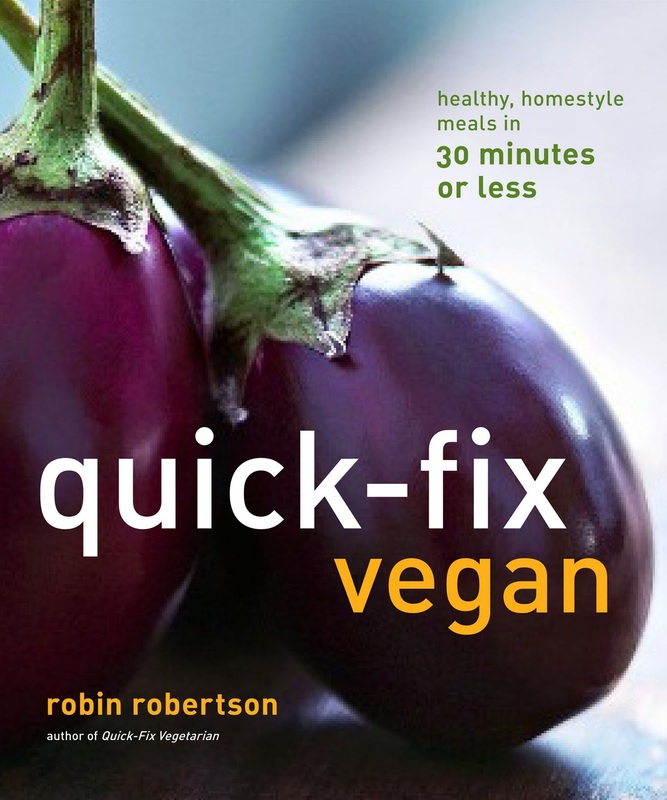 And don't forget to enter to win a copy of Quick-Fix Vegan - (contest closes Sunday night). In the days leading up to Halloween, I'll be posting some fun ways to celebrate the holiday with food, beginning with breakfast. 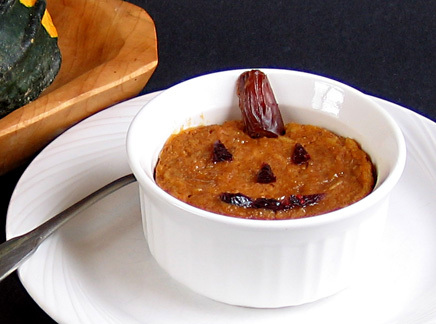 Who wouldn't get into the Halloween spirit when they see this cute little Jack o' Lantern greeting them at the breakfast table? 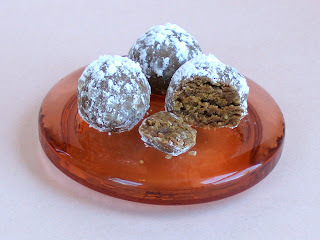 There are lots of ways to make baked pumpkin oatmeal, but I made these little guys using a short-cut method. 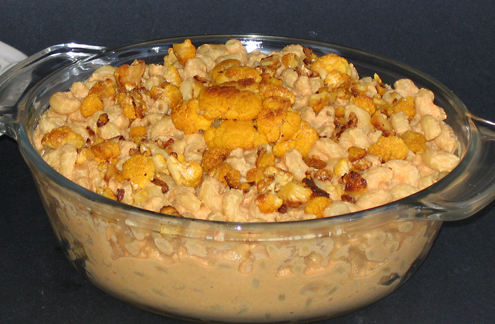 To already cooked oatmeal, I swirled in just enough canned solid-pack pumpkin to turn the oatmeal a lovely orange color. I then added some brown sugar, cinnamon, nutmeg, allspice, and ginger to make it taste like a cross between pumpkin pie and oatmeal cookies! I then scraped the oatmeal into various baking pans and dishes, notable mini-springform pans and single-serve souffle dishes. 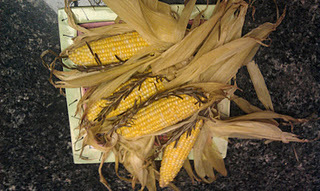 I then baked them until they got nice and firm and puffed up a bit. 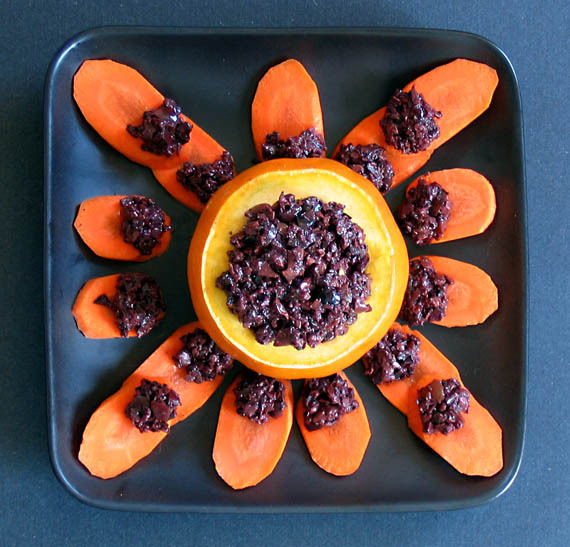 To make the Jack o' Lantern faces, I just cut up some dried blueberries because they were nice and dark. I used pieces of pitted date for the pumpkin stem. Quick-Fix Vegan Giveaway -- and Last Week's Winner! The winner of this week's "Make My Monday" cookbook giveaway, chosen randomly is #12, VeggieAmanda, whose favorite pantry ingredient is nutritional yeast. Congratulations!!! Send me an e-mail with your mailing address and I'll get a copy of Vegan Unplugged right out to you. For my final cookbook giveaway during VeganMoFo, I am giving away a copy of my brand new cookbook: Quick-Fix Vegan: Healthy, Homestyle Meals in 30 Minutes or Less. If you've been following my blog, you've seen loads of amazing tester photos from this book, as well as a few sample recipes. 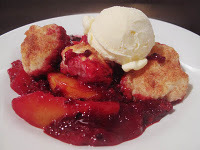 I've also posted a list of many of the recipe titles here. Okay, so how do you win a copy? Simple: just leave a comment at the end of this post that answers this question: "Why would you like to win a copy of Quick-Fix Vegan?" The contest closes Sunday night 10/30 at midnight. The winner will be announced next Monday 10/31. So, tell me, why do you want to win a copy of Quick-Fix Vegan? 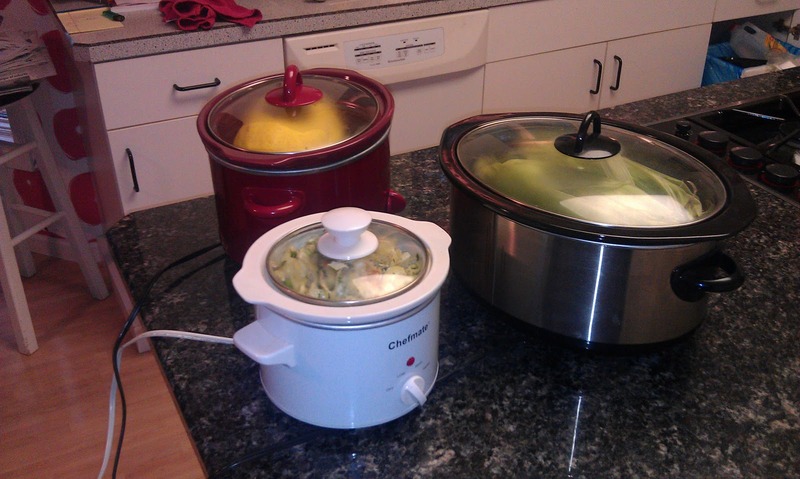 What's In the Slow Cooker? 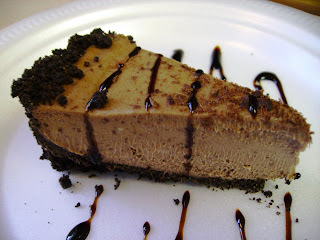 During VeganMoFo I designated Saturday on my blog as "Sweet Tooth Saturday," so here is a photo of the sublimely delicious (as well as quick and easy) chocolate cheesecake from Quick-Fix Vegan. In the book, the cheesecake is made in a square pan, although it can also be made in a springform pan as in this tester photo (shown here with a drizzle of balsamic glaze -- thanks, Lea!). 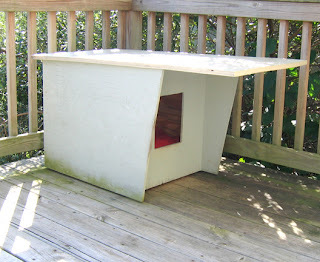 Today is also "Caturday" which brings us to the real star of today's post: the custom house that Jon built for Jason, the semi-feral cat that shares our property and our hearts. Several people asked to see photos of Jason's house and I'm happy to oblige. As you can see in this first photo, Jon designed the roof to have a wide overhang in the front so that Jason can eat and drink in the shade when it's hot and stay dry when it rains or snows. The sides of the house extend in the front a bit as well, against the wind. Jason like to relax on the flat roof in the summer. Jon made this house with some plywood and 2x4s. 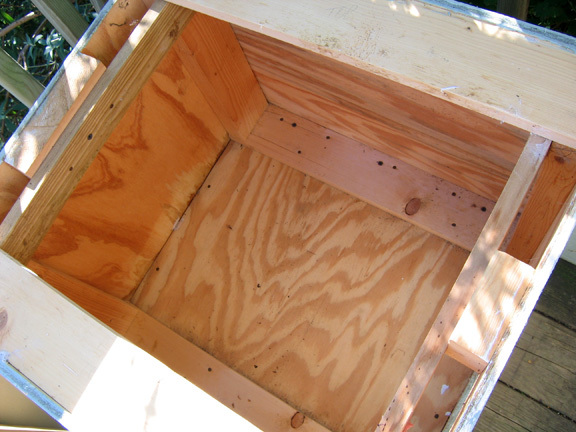 It's solid, and the removeable roof is great for cleaning out the house. The interior is easy to insulate during cold weather. In the warmer months I put in an outdoor chair cushion for Jason to sleep on, usually with a towel on top that I replace frequently, especially if it's rainy to avoid dampness in his house. We've positioned the house just a few feet across from our back door so I can keep tabs on Jason and also so he can feel like he's part of the family. 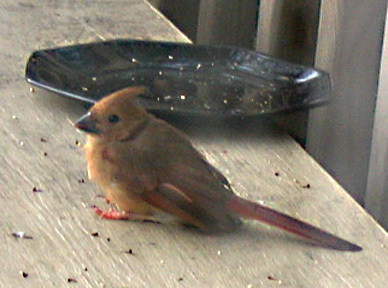 He likes to hang with Gary at the back door. 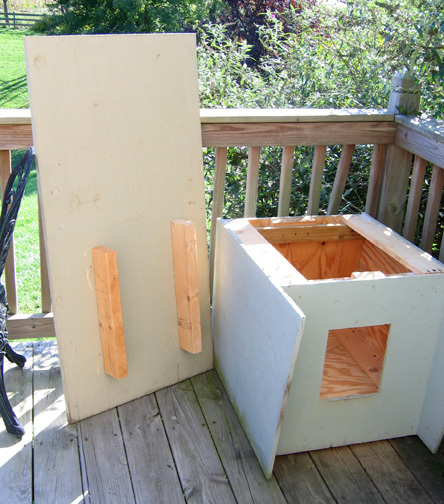 If you're not handy with a hammer, you can buy a ready-made shelter, but even if you're not a master carpenter, there are lots of simple house designs you can find like these from the Maryland Feline Society. 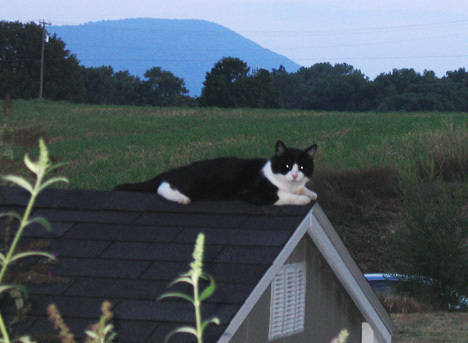 There are also some great tips for helping feral cats in the winter on Alley Cat Allies. 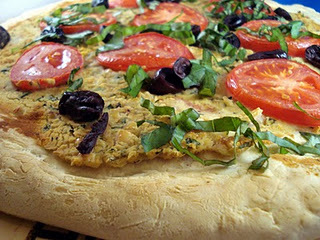 For this week's "Flashback Friday" we revisit the pleasures of the Tuscan White Bean Pizza from Vegan on the Cheap. 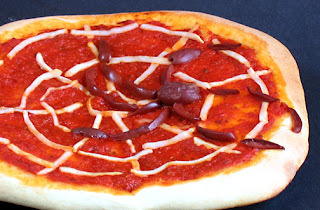 This insanely delicious pizza recipe is extremely popular among fans of VOTC and it's no wonder: it tastes fabulous and is ideal for cooking vegan “on the cheap,” because it doesn’t call for any expensive vegan cheese. 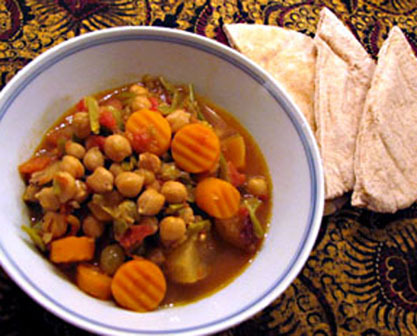 Instead, it has a creamy garlicky bean topping that is low in fat, high in protein, and, best of all, cheap to make. 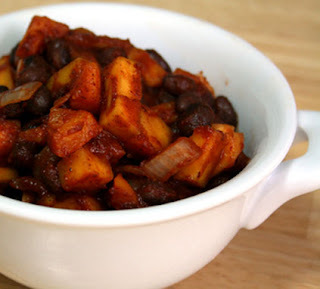 Remember, all the recipes in Vegan on the Cheap cost between 50 cents and two dollars to make, so you can easily eat wonderful vegan meals for just a few dollars a day. 1. Make the dough: In a large bowl, combine the flour, yeast, and salt. Stir in the water until combined then use your hands to knead it into a soft dough. 2. Transfer the dough to a lightly floured work surface and knead until it is smooth and elastic, about 10 minutes, adding additional flour as needed so it doesn’t stick. Shape the dough into a smooth ball and place in an oiled bowl. Cover with plastic wrap and let rise at room temperature in a warm spot until double in volume, about 1 hour. 3. After the dough has risen, transfer it to a lightly floured work surface, punch it down and gently stretch and lift it to make a 12-inch round about 1/4-inch thick. Transfer the round to a floured baking sheet or pizza stone. Let the dough rise in draft-free place for 20 minutes. Adjust the oven rack to the bottommost position of the oven. Preheat oven to 425 degrees F.
4. Make the topping: In a large skillet, heat the oil over medium heat. Add the garlic and cook until softened, about 2 minutes. Add the beans, salt, and pepper. 5. Mash the beans to break them up, then stir in the water and simmer, stirring occasionally, until the mixture is creamy, about 8 minutes. Stir in the basil and set aside. 6. To assemble the pizza, spread the bean mixture evenly on top of the dough round, to within 1/2-inch of the edge. Arrange the tomato slices on top and season with salt and pepper to taste. Bake until the crust is browned, 12 to 15 minutes. Serve hot. 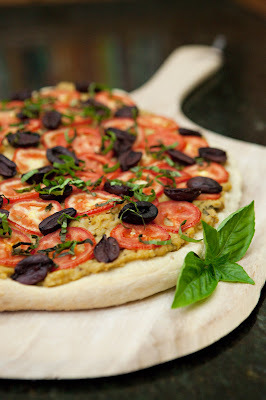 Splurge a little: Add sliced pitted kalamata olives when you add the tomatoes. Garnish with thin strips of fresh basil leaves. 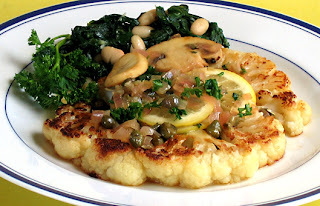 On this "Food for Thought" Thursday, the subject is cauliflower, specifically Mac and Cheddar Cauliflower. I don’t mean mac + cheddar + cauliflower – I mean macaroni with “cheddar cauliflower” – a gorgeous pale orange colored cauliflower that proved to be an ideal ingredient in my latest foray into the developing the perfect vegan mac and cheese. In mac and cheese recipes over the years, I’ve used everything from potatoes and carrots and roasted red, orange, and yellow peppers to add that “cheesy” color to mac and cheese. I had been experimenting with a new version using cauliflower anyway, so when I saw the gorgeous orange crucifer labeled “cheddar cauliflower” I knew I had to get it and how I’d be using it. 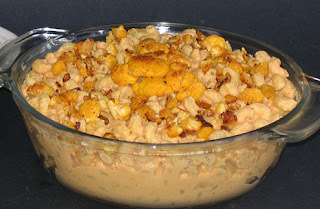 Here, then, is the recipe for “Mac and Cheddar Cauliflower” – of course the recipe works just as well with white cauliflower – the pimientos, mustard, and nutritional yeast all combine to add color to the dish, but if you’re fortunate enough to find a cheddar head, it’s really fun to use in this mac and cheese recipe. As you can see in the photo, the top of the casserole is strewn with extra pieces of roasted cauliflower goodness. I realize there are a lot of “or more”s in this recipe – that’s because you get to make mac and cheese just the way you like it – as saucy as you want it, as cheesy as you like. You can even add some shredded Daiya cheddar if you want to, but I’ll take my cheddar...cauliflower! Preheat the oven to 425 degrees F. Arrange the sliced cauliflower on an oiled baking sheet and roast until soft and lightly browned, turning once, about 20 minutes. Set aside. Reduce the oven temperature to 350 degrees F.
White the cauliflower is roasting, cook pasta in a pot of boiling salted water until al dente. Drain well and set aside. In a food processor or high-speed blender, combine the cashews and broth and blend until smooth. · If you prefer a thinner sauce: add up to 1 cup of additional vegetable broth or your favorite plain unsweetened nondairy milk. 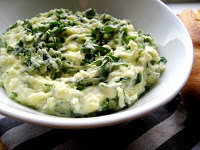 · If you want a “sharper” flavor: add more lemon juice and/or mustard, a little at a time, mixing well after each addition. For a non-saucy (but flavorful) texture, transfer all of the cooked pasta to a lightly oiled baking dish. For a saucy texture, transfer one-half to two-thirds of the cooked pasta to the baking dish and pour in the sauce, stirring to coat. It will be very saucy, but the pasta will absorb some of the sauce. 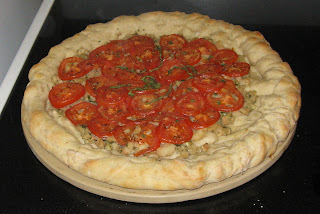 If you like a saucy texture with no crumb topping, cover tightly and bake for 20 minutes or until hot. If you like a crunchy crumb topping, sprinkle the top with toasted panko crumbs and bake an additional 10 minutes. For an even saucier version, omit the baking step altogether, and combine the pasta and sauce on top of the stove (in whatever proportions you prefer) and heat until hot. Note: If you were able to find cheddar cauliflower, sprinkle the top of the casserole with any remaining “crumbs” of roasted cauliflower – it tastes delicious and looks good, too! Another note: To add some color (and more veggies) stir in 1 to 2 cups of a cooked green vegetable such as chopped broccoli or asparagus, or thawed frozen green peas. In the true spirit of Wildcard Wednesday, the following is a guest post by a friend who lives and works on the other side of the world in a “dry” land. The post chronicles his experience making his own artisanal fermented beverage, aka "moonshine." I’m friar Loshlane and my sidekick is friar Pumpernickel. We are not real friars, but to maintain anonymity in our rebellious endeavors, in a land reflective of the prohibition years in America, we thought it best to exercise discretion while sharing the story of the birth and development of our baby. Born on September 5th, she is five gallons (somewhat less now) of bubbling, breathing, discharging, joy. Meet Miss Mead! Friar Pumpernickel and I used a traditional uncooked mead recipe as our guide. We believe if ancient orders could concoct relatively safe beverages worthy of religious celebration, neither should we require modern apparatus and tedious technique. According to one source, the first mead was gathered, not made by humans. Bees made it. Accidentally of course, and I’m sure the first human to dip his hands into the hollowed tree for a drink found the effect of fermented honey water quite interesting. And humankind has been chasing the mind altering effects of alcohol ever since. Friar Pumpernickel chopped fruit while I activated the yeast. We multiplied by five a recipe for one gallon and used a five-gallon water jug, still sealed, effectively eliminating the need sterilize the container. The water provided a known clean source. Tap water, especially in a foreign country, won’t do. We emptied half the water, stuffed in apples, raisins, oranges, and peaches. Then we added the yeast. Now we had to aerate her. The directions said shake vigorously for ten minutes. Friar Pumpernickel said, “Yeah, good luck with that.” I eyed him apprehensively, looked over at the jug. Replaced the original cap, secured it with duct tape, and I took it to the hallway. I laid it on its side, expressed my apologies, and began briskly kicking the jug around the apartment. This is the only time you’re allowed to handle your mead in this manner! So get all your frustrations out now. After aerating, and in honor of Robert Boyle, we stretched a balloon across the mouth of the jug to maintain a pristine environment for our newborn, while allowing for expansion and expulsion of excess gases. Within two hours the balloon began to inflate. I mean really inflate! Millions of tiny cells were eating sugars and converting oxygen into carbon dioxide in magnificent cellular respiration! We carefully executed an extremely delicate balloonostomy; we made a needle hole near the top of the balloon to relieve excessive pressure. The balloon properly attached and vented we placed our newborn into elementary school where she learned the way to refinement through exhaustive repetition, or repetitious exhaustion. At fourteen days the yeast was still in full respiration so we allowed her a few more days. Finally on day eighteen we racked our baby, sending her off to secondary school. At this point we added pureed peaches, four in all, enough to give the remaining yeast something to gnaw. Our young mead studied for another twenty-three days, when on that day we racked her again. Off she went to finishing school. At forty plus-days her complexion and bouquet have improved dramatically. The yeast scent is gone and her flavor has mellowed from brandy-like to that of a Riesling. So now we wait for Miss Mead to age. We’re going to rack her again around day seventy-five. Until then we ponder the days of speakeasies and rum runners, and salute those who lifted the first mouthfuls of fermented drink to their lips. Take some time to Google mead and vegan mead. And take a look at the recipe on stormthecastle.com - on the left hand column, look for "Fast Mead Recipe." There are some steps there that I think are vital to making a traditional mead, steps one must follow, steps not mentioned in modern techniques. The photo of the bottle lying on its side is important in demonstrating one of the steps. Preventing aeration at this point is as important as aerating in the beginning of the process. 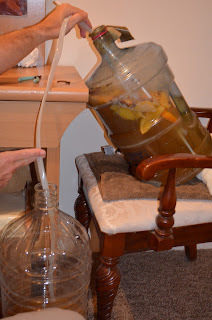 We really kicked the crap out of our jug, for ten solid minutes, in order to achieve the aeration you see in the first picture. The nice thing about our jug was the handle, it acted as a sort of mixing paddle, very nice effect.We are just beginners at this. So I recommend you do your research. We researched this topic for nearly a year before finally deciding to move forward. This "Tester Tuesday" post features more recipe tester photos from my new book, Quick-Fix Vegan: Healthy, Homestyle Meals in 30 Minutes or Less. These particular photos are a mini-tour of recipes from around the world. At the top of this post you see luscious Spicy Smoked Portobello Tacos -- so easy to make and loaded with flavor. Mushrooms never tasted so good! Here is another favorite, Deconstructed Bahn Mi Salad -- if you're a fan of my blog, you know how much I love the flavors in a bahn mi sandwich -- heck, I've even made a bahn mi pizza! But for those times when you want all the flavor without all the bread, this salad is the answer. You can make it with your choice of seitan or tofu and garnish with a few slices of toasted baguette. 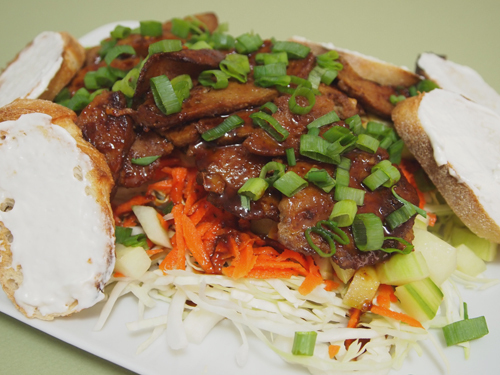 Speaking of seitan, here's an elegant and delicious way to serve it. 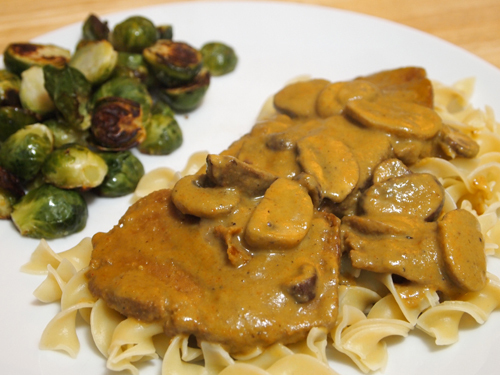 Seitan Forestiere is made with a creamy mushroom sauce inspired by the classic sauce of the same name. 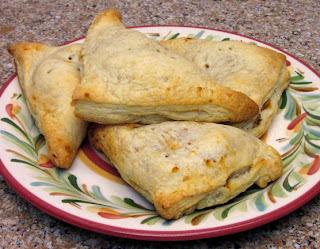 Finally, we have the Special Spicy Empanadas. Made with a puff pastry dough and a sweet potato and pinto bean filling, these empanadas can be assembled in a flash (even faster if you have a leftover baked sweet potato) and bake up in just 20 minutes. I hope you enjoyed this little trip around the world with Quick-Fix Vegan. Thanks to everyone who has e-mailed me about my new book, and also to those who've mentioned it on their blog, Facebook, Twitter, and Amazon. I'm very appreciative that this book is being so well received and hope you'll continue to help me get the word out to others about it. How better to brighten a Monday than with a new cookbook giveaway! But first, it’s time to announce the winner of last week’s giveaway. The winner (chosen randomly via Random.org) of a copy of Vegan Fire and Spice: 200 Sultry and Savory Global Recipes is: #15 – Celyn. Congratulations, Celyn! Please e-mail me with your mailing address and I’ll get the book right out to you. And now for a new “Make My Monday” giveaway. This week’s prize is a copy of Vegan Unplugged: A Pantry Cuisine Cookbook and Survival Guide. 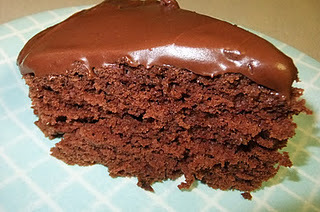 My husband Jon write the survival guide section (a must-have for whenever the power goes out -- we lived through a few hurricanes, so I know) and I wrote the 80 recipes, all of which can be made using only pantry ingredients and can be ready in less than 15 minutes. 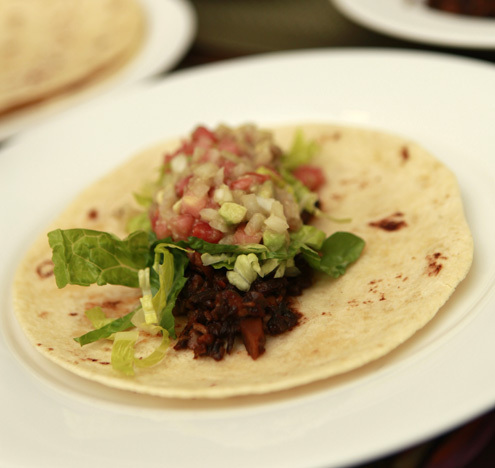 The best part of these recipes is their versatility: if you have fresh or frozen ingredients, you can use them, but if you only have canned or dehydrated ingredients, these recipes can be invaluable. The contest closes Sunday night 10/23 at midnight. The winner will be announced next Monday 10/24, when there will also be another new giveaway! So, tell me, what's YOUR favorite pantry ingredient? On Facebook today, I posted about this being National Feral Cat Day. Visit Alley Cat Allies to find out how you can help these wonderful cats. 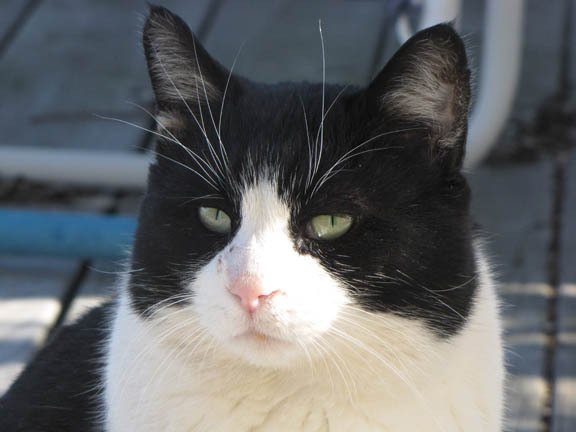 I realized that not all of my blog readers also follow me on Facebook, so I thought I'd repost this information here as well as tell you a bit about the feral cat we share our lives with. Meet Jason Jeff Robertson. Jason is our beloved semi-feral cat. He "came with the house" when we moved here -- the previous owner called him "Kitty Brother" -- he fed him daily but he remained feral. He's about 9 years old now and he lets me pet him, though he remains cautious. Jon built him a great house on our deck and Jason seems content to be "semi-feral" -- he loves being in the woods on our property, but enjoys the refuge of his house in bad weather, as well as the love, attention, food, and water he gets from us daily. Jason resembles our cat Gary, so much so that when we first saw Jason, we thought Gary had escaped the house -- although in reality, Gary is about twice Jason's size. 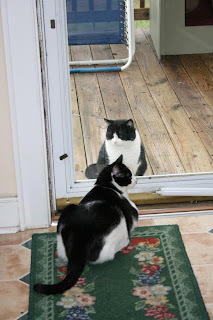 Gary and Jason "play" with each other through the glass storm door. Mitzki doesn't care for Jason, but then she's not all that crazy about Gary either. Please visit Alley Cat Allies and do what you can to help feral cats. They need our support!